We've been listening to the Tales of Beatrix Potter on CD this week. Wow! I've always paid more attention to the illustrations than to the writing, but listening to Potter's words narrated in a beautiful British voice is amazing. They describe the delightful details of cottage life, especially in the kitchens. I can't think of a better way for children (and adults) to absorb the rich and complex language of Potter's Victorian England. Of course, all this listening has put me into full British mode. 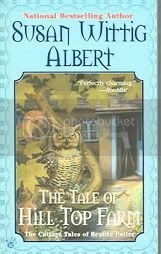 I had to round out my library bag with two new mysteries by Susan Wittig Albert, The Tale of Hill Top Farm and The Tale of Holly How. Albert sets these in Potter's farming period and populates them with the villagers and animals of Sawrey. A tad sweet for a mystery, they are a still a fun way to flesh out Potter's life and landscape in your own imagination.